You’re brushing your teeth one night, and you’re trying to be as gentle as possible because your gums have been feeling extra sensitive lately. Then, you look down in the sink, and you see a distinctive pink color. Now they’re bleeding! Both of these are signs of the most common dental problem in the world today, gum disease, also known as periodontal disease. According to the Centers for Disease Control, nearly half of the U.S. adult population currently has gum disease, and most are completely unaware. It is actually an infection in your gums and the bone surrounding your teeth brought on by bacterial plaque, and in order to eliminate it, you need to see a dentist right away. How will they treat your gum disease? Below, we detail the 3 most common methods so you can know what to expect when you make an appointment. When it comes to treating early-stage gum disease, scaling and root planing are considered the gold standard. Collectively, they are sometimes referred to as a “deep cleaning,” and the procedure is one of the most cost-effective and minimally invasive ways to arrest the advance of gum disease. Using a small tool known as a scaler, your dentist will begin the procedure by gently breaking up and clearing away plaque and tartar (hardened plaque) deposits from around and below your gum line (scaling). Then, root planing will be used to gently smooth out the rough surfaces of your teeth’s roots, making it harder for plaque to accumulate on them, which will lessen the chances of developing gum disease in the future. Dentists have been using lasers for a wide variety of procedures since the mid-90s, and when it comes to treating gum disease, they are particularly useful. A laser uses an extremely concentrated beam of light to instantly vaporize any harmful bacteria present around the gum line. The laser itself doesn’t create that much heat, and it’s so precise that it doesn’t affect any of the surrounding healthy tissue. This means it will not only eradicate your gum disease, but the procedure itself will also be virtually painless. This may be used by itself or in conjunction with a scaling and root planing treatment. After your initial periodontal cleaning, you and your dentist may choose to use something called irrigation medication, in which your dentist will use a small syringe to gently apply a topical antimicrobial agent directly to your gums. This agent will be able to reach even the deepest, most hidden bacteria and prevent it from causing reinfection. 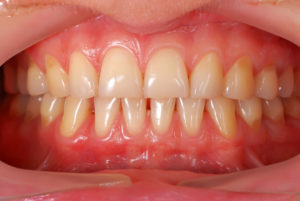 This procedure has also been shown to reduce the size of periodontal pockets, which are the small spaces between your teeth and gums where bacteria tends to gather and multiply. No matter what method your dentist decides upon, you can trust that your gums will soon feel less sensitive and you won’t be seeing any pink in your sink. If you have red, swollen, or tender gums that tend to bleed whenever you clean them, be sure to contact a dentist in your area soon so they can get you the treatment you need. Dr. Jeremy Jorgenson is a general, restorative, and cosmetic dentist based in Costa Mesa, CA, and he has spent years learning how to prevent and treat gum disease in order to better preserve his patients’ long term oral health. He currently practices at Advanced Dental Care, and he can be reached through his website or by phone at (714) 424-9099.